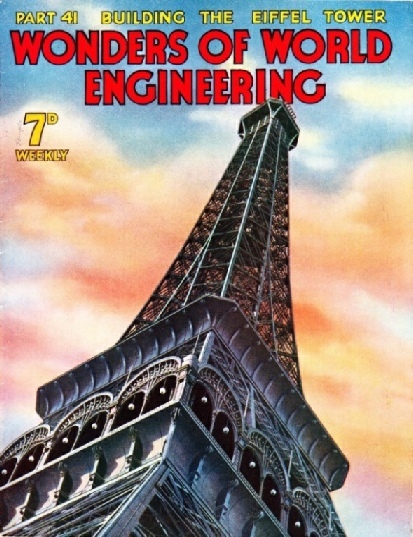 Part 41 of Wonders of World Engineering was published on Tuesday 7th December 1937, price 7d. 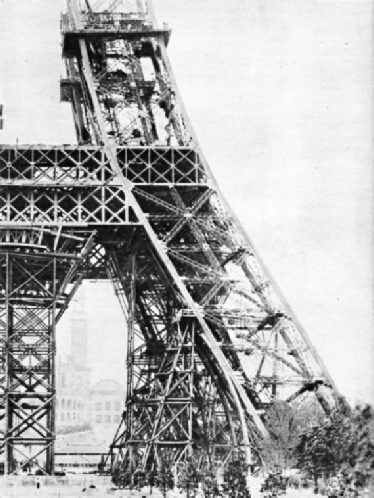 Part 41 includes a photogravure supplement showing the construction of the Eiffel Tower. 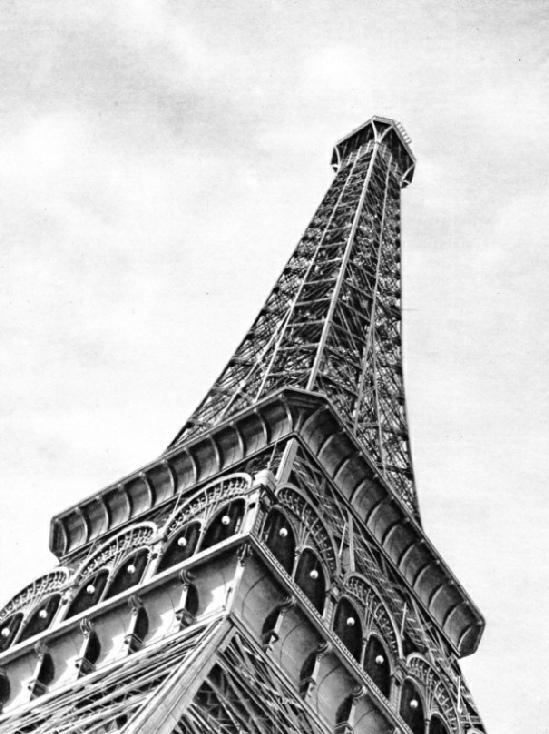 This section illustrates the article on The Eiffel Tower. The cover of this week’s Part shows the upper portion of the Eiffel Tower. This striking photograph is reproduced in the photogravure section on page 1173. This chapter on military engineering, contributed by F E Dean, covers every activity of the Royal Engineers. The article is concluded from part 40. Despite the enormous variety in size and power of oil engines used to-day on land and sea, the manufacturing processes are generally the same, although they differ slightly in detail according to each maker’s standard practice. The applications of the oil engine on land and on sea are almost universal. Oil engines are yearly playing an increasingly predominant part in road and railway transport, and it is a remarkable fact that nearly two-thirds of all the marine engines under construction at the present moment are oil-driven. The building of these engines forms one of the most important and responsible activities of the engineer. The methods and processes of building oil engines vary in detail according to the standard practice of individual makers, but, generally speaking, the same principles are adopted everywhere. All the larger parts of the engine, that is to say, the engine bed, crankcase, cylinders, pistons and the like, are cast from wooden patterns. The casting then has to be planed in a machine known as the plano-miller. Housings for the cylinders are drilled in vertical-spindle or horizontal-spindle drilling machines. 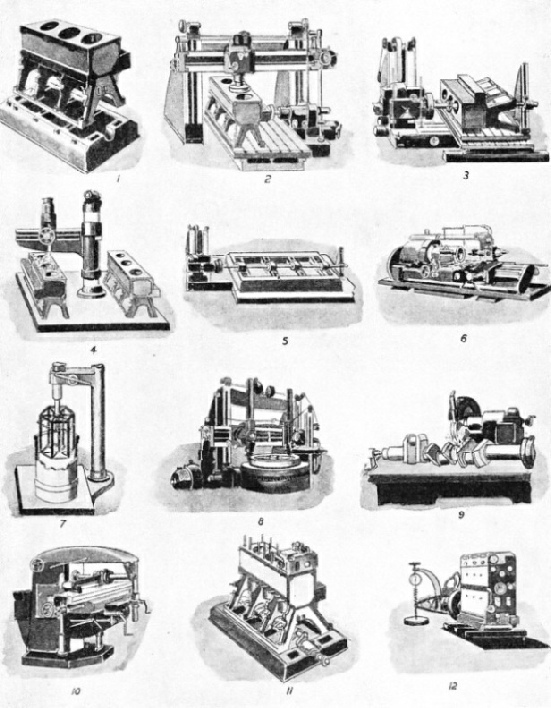 A description of the building of an oil engine helps in the understanding of the principle on which it works. This chapter, by Edwin Judd, describes oil engines and their construction. 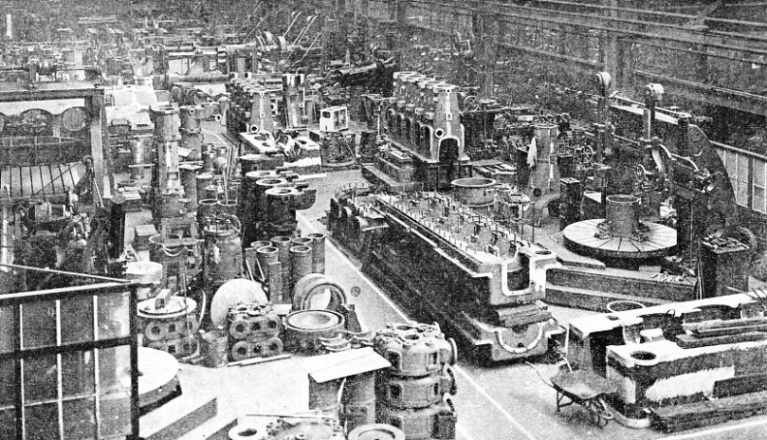 HEAVY MACHINE SHOP in a maker’s works where large types of oil engines are built. All the larger components of an oil engine, such as engine bed, crankcase or frame, cylinders, pistons and the like, are cast from wooden patterns and finished by machines such as lathes and planing machines. For smaller parts iron patterns are generally made. FROM THE GROUND TO THE FIRST PLATFORM proved the most difficult and dangerous section in the building of the Eiffel Tower. 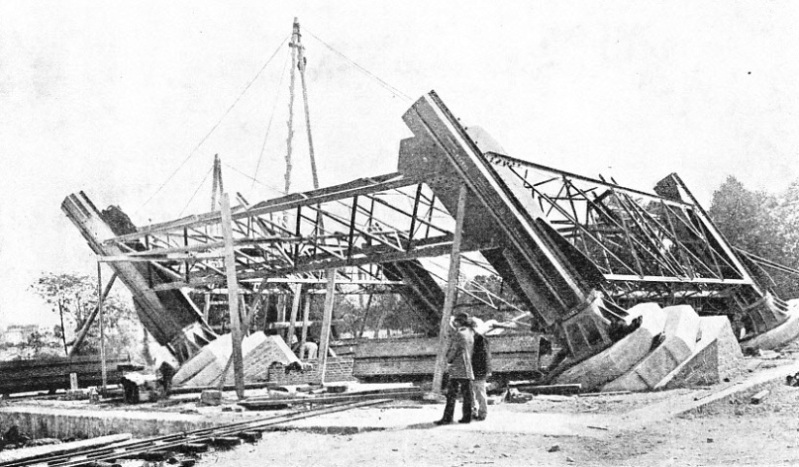 Although Eiffel had contrived to build many of his great bridges without the aid of centering, the weight and inclination of the box girders made it necessary for them to be temporarily supported by triangulated wooden columns. When the four great legs, however, had been united by the massive horizontal girders of the first platform, the whole formed a strong, rigid base for the rest of the tower. RAILWAY ENGINEERING is an important activity of the Corps of Royal Engineers. 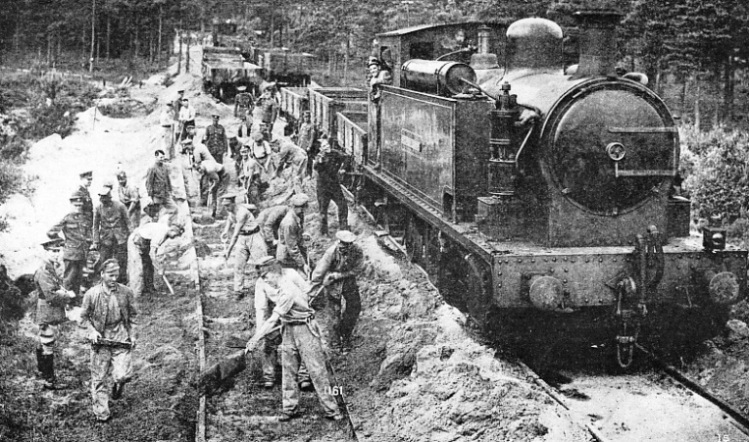 This photograph shows a Supplementary Reserve Company, the 150th (LNE) Railway Construction Company, Royal Engineers, at work relaying a portion of track near the training camp at Longmoor, near Liss, Hampshire. In addition to standard-gauge lines, the Royal Engineers have to lay many miles of light railways in time of war. The steam railway locomotive’s history began in 1804. In that year Richard Trevithick demonstrated the capabilities of a railway engine in South Wales. John Blenkinsop’s engine began to run in 1812. Of the other pioneers the most famous was George Stephenson, whose Rocket of 1829 gained world renown. Among the most popular chapters in this work are those which deal with the powerful modern locomotives of Great Britain and of North America. The origin of the modern locomotive forms an absorbing study, particularly in comparison with the amazing locomotives that have already been described in Wonders of World Engineering. In this chapter C Hamilton Ellis describes the developments which early locomotive engineers quickly produced as the demand for steam-driven transport began to grow. This id the fifth article in the series on Invention and Development. Railway Wonders of the World. ANCESTOR OF THE WORLD’S LOCOMOTIVES, Trevithick’s engine of 1804 ran on a mineral tramroad at Penydarran, near Merthyr Tydfil, South Wales. The single cylinder communicated its motion to the four road wheels through a flywheel and gearing. The illustration is only of approximate accuracy, as no authentic drawings of the engine exist. 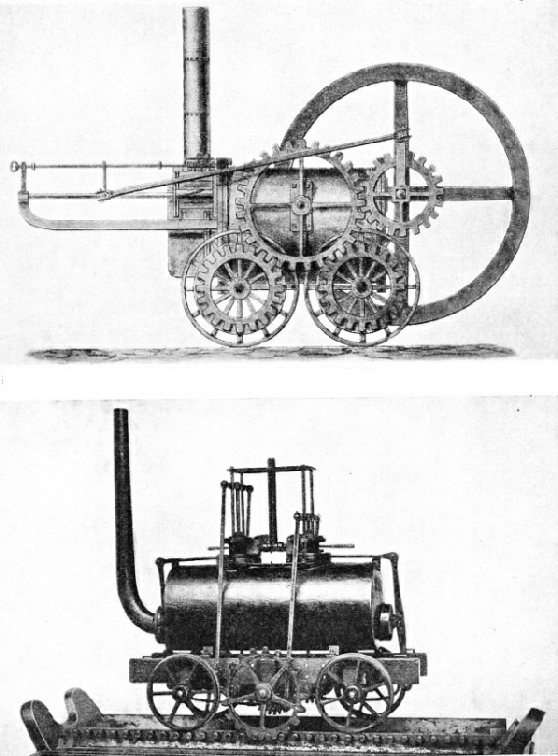 BLENKINSOP’S LEEDS LOCOMOTIVE, the first commercially successful engine in the world, went into service in 1812. It had, fitted in the top of the boiler shell, two vertical cylinders which drove a sprocket wheel, whose teeth engaged with a rack on the side of the rail. The power of the wind is one of the forces of nature that man from time immemorial has harnessed in various ways. Modern developments from the various types of windmill are used for driving ships, for pumping water and for generating electricity. At one time windmills, of which there are many varieties, were an important feature of life in Great Britain and in the Low Countries, as well as in other parts of the world. This chapter is by Rex Wailes and is concluded in part 42. 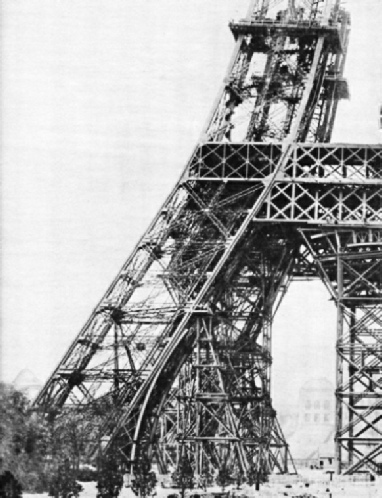 THE COMPLETED BASE of the Eiffel Tower formed a rigid support for the remaining portion of the tower. The level of the first platform is 189 feet above the ground. The four legs continue to converge until they meet the second platform, at a level of 379 feet. Lifts run up to this platform along inclined shafts in all four legs. display. Grouped round its four massive “feet” were the buildings of the 1937 Exhibition. When visiting Pans recently your editor could not help drawing an unfavourable comparison between the temporary structures which housed the latest spectacular products of civilization and that permanent memorial to engineering skill, the Eiffel Tower, which raises its iron frame a thousand feet above the city. Although it can claim no longer to be the highest structure built by man, it stands unique as a pinnacle of engineering in the last century. 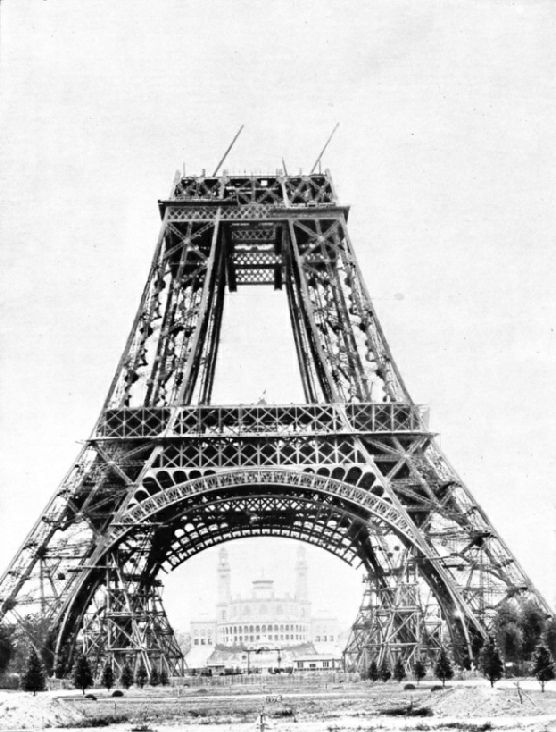 The romantic story of the building of the Eiffel Tower is described in this chapter by Lieut.-Commander R T Gould, who contributed the chapter on skyscrapers in Part 17. This chapter is illustrated by some remarkable photographs, including a section in photogravure, of the Eiffel Tower in course of construction. The task of erection was difficult, as the chapter will show. ONE OF THE FOUR “LEGS” of the Eiffel Tower. Each leg was composed of four iron box girders, connected by lattice girders to form, in effect, a skeleton tube about 50 feet square in section. Founded on massive masonry piers, the box girders were inclined inwards at an angle of about fifty degrees to the ground. Iron bolts 20 feet long were built into each pier to hold the lower ends of the girders. A FAMOUS PARISIAN LANDMARK, the Eiffel Tower was designed and built for the great Paris Exhibition of 1889 by Alexandre Gustave Eiffel, an enterprising and brilliant engineer. The structure is 984 feet high, and is situated in the Champ de mars, beside the River Seine. This photograph shows the upper section of the tower and the second intermediate platform, 379 feet above the ground. In planning the ironwork, 12,000 working scale drawings were required. This photograph was also used on the cover of this part. 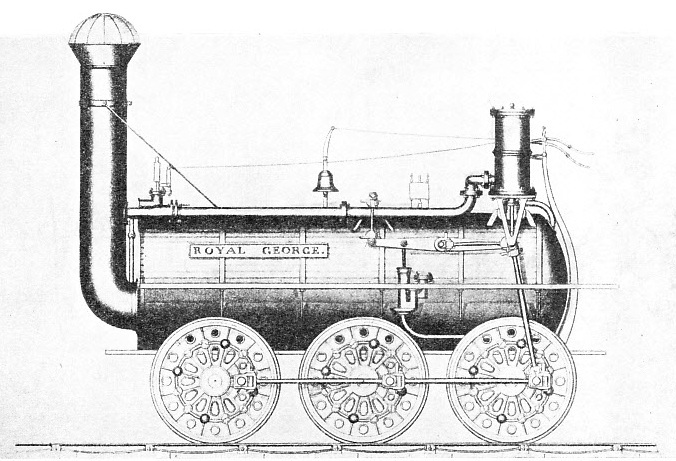 WITH ALL SIX WHEELS COUPLED, the Royal George of 1827 was the first engine to have this wheel arrangement, still common for goods locomotives in Great Britain. Two vertical cylinders drove the rearmost axle. The return-flue boiler had its firedoor and chimney at the front. The designer was Timothy Hackworth, Locomotive Superintendent of the Stockton and Darlington Railway, the world’s first public railway. 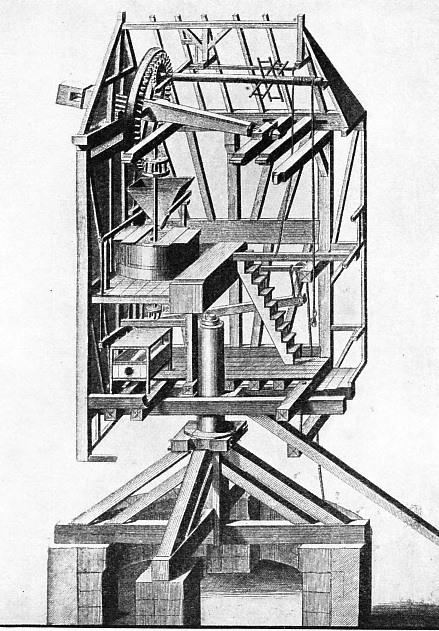 SECTION OF A POST MILL, as illustrated in Diderot’s Encyclopaedia, published in the eighteenth century. The earliest mills were of this type, machinery and sails being supported by and pivoting on a central post. In this diagram the sails are not shown.